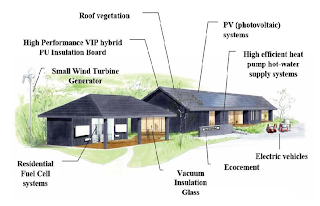 Japan's Ministry of Economy, Trade and Industry (METI) has unveiled its “Zero-Emission House” in parallel with the Hokkaido Toyako G8 Summit that is currently taking place. 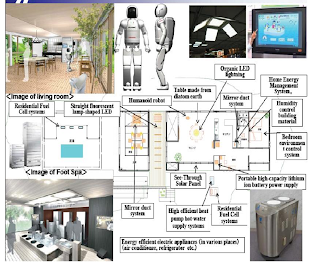 This prefabricated house exhibits robots that serve tea to guests, a washer that requires no water, an air conditioner that sends cool air towards people in a room rather than general empty space, and a wind-turbine generator and a photovoltaic system which produces about 15 kilowatts of energy a day. The structure has great insulation, natural aeration to maintain dry conditions and is designed with the seismic technology, SHEQAS, to mitigate damage due to earthquakes. The waterless washer is a three-in-one machine that uses high-powered air to wash clothes without water. The process known as "ozonation" uses about twice as much electricity as a regular wash, but only one-fifth the total energy of a comparable full wash and dry because it operates without a drying system. Additionally, there is a solar-powered TV, a roof-top vegetation system comprised of a thin film of moss grown on tile plates attached to the roof of the house which can also be fitted and grown alongside solar panels.